AS THE STONES ONCE SAID, you can’t always get what you want. Time and time again, we aim high and settle for something less. It’s not necessarily a bad thing. I was supposed to be living in Spain right now. I could’ve bought a hostel two years back in Montañita, or run my own hotel in the Midwest. But plans change. Opportunities come and go, and you make the most of what’s presented to you. You can’t stress what could’ve been. Instead, adjust, and turn a negative into a positive. So it goes with blogging. What was originally scheduled to be a 7-part, 10,000-word post dissecting my final 3 options slowed to a crawl and resulted in a 3-part inconclusive spiel which left Palmeiras and Santos unexamined and my allegiance in doubt. But plans change. Few things go as anticipated in life, and similarly, my writing plans have changed. I won’t be doing a Palmeiras post, or a Santos one. After months of indecisiveness and indifference, my heart has stepped in and played facilitator. Seven months after my original deadline, my mind’s made up. Here are the 4 things that helped me decide. As stated in Part II of my ‘Choosing a Brazilian soccer team’ series, relevance is fundamental. If immersion is what I’m after, I need a team that will be on TV and play in big games. Enter Palmeiras. Despite sneaking in to Libertadores on account of their Copa do Brasil championship, o verdão will be spending the 2013 season in Serie B following their unprecedented relegation, and that is unacceptable. Now that Corinthians are no longer the defending Brazilian champs, and are instead FIFA Club World Cup champions, all of São Paulo’s teams have clean slates, so for the first time since my arrival, there’s no bandwagon jumping in play. I tried for several months to watch a Santos game before making a decision. I tried and I failed. Santos games are rarely played in SP, and sometimes the venue isn’t decided until the week of the game, making it close to impossible for me to attend a game, which was always a must. My biggest hangup with Palmeiras and Corinthians was that I couldn’t bring myself to hate either one, making either team undesirable. But after reading this, I’ve been moved to push that thought aside. I may not like the Lakers, Yankees or Irish, but I’d certainly cheer for them against Russian, Canadian or French teams in international competition. Hate doesn’t have to go that far. So despite word that Santos may be moving more games to SP in 2013 or 2014, there’s only one team left of the three that is relevant and accessible in SP. One team with a fan base passionate enough to nearly destroy an international airport in anticipation of the team’s departure for Japan. One movement passionate enough to inspire two fans to take to the streets in Santiago after their team’s recent victory over Chelsea, team flag in hand, chanting fight songs with no one around to hear. One team with enough momentum to move Nike to place this billboard within blocks of Chelsea’s home turf. And only one team that has truly piqued my interest since I arrived. That team, of course, is Corinthians. From this day on, I bleed black and white. I stand with the bando de loucos. I wanted a reason to cut my hair like Neymar and support Santos. And I tried, I really did, to sympathize with Palmeiras, whose mid-table anonymity (a phrase my friend Matt coined) reminded me of my own struggles with teams back home. 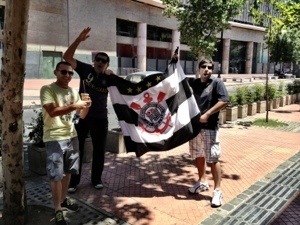 But Santos doesn’t play in SP, and their fanbase is close to non-existent. And Palmeiras is in Serie B. It wasn’t as I’d planned, but life’s like that sometimes. Things change, you adapt, you make the most of it, and you move on. Why fight the waves when you can learn to surf instead? P.S. Anyone have a bedroom for rent? Maybe I’ll catch you at a game next year. All the best and have a wicked new year! Andy Martin recently posted..Expat or immigrant? Thanks Andy! Game day outing is getting thrown on the to-do list for sure, happy and safe new year to you too, see you back in SP in 2013! Obrigado irmão, demorou mas eu acho que valeu a pena! Hello 10kJuan, I have just read your history about choosing a soccer team, and for the right choice I would like to share you a beautiful history (for “lazy” reasons, I used a google translator, but it is understandable, :-) ) , that is close to yours…. - Dad, I’m rooting for that team? The father immediately detected the problem. Do not care much for football, had never talked to her son about it. He realized that the boy had reached an age where being a fan is required. He decided he would work to repair the error. He promised his son that would take him to games of all big clubs from São Paulo, that the boy had every opportunity to choose your team’s heart. He made the proper homework. Learned the facts, names, times and places significant in the history of each club. The first visit was to Morumbi, an afternoon game of São Paulo. They arrived early, spent the Memorial, saw the trophies of the Copa Libertadores, Intercontinental Cup. - Son, São Paulo is the most successful Brazilian club on the international stage. Won the Libertadores three times, went to Tokyo twice to win the Intercontinental Cup, also has a FIFA Club World Cup. Moreover, it was the first club in the city to have its Training Center. And, of course, is the owner of that stadium, the Morumbi, São Paulo’s largest. The game was great, São Paulo won the boy was impressed with the size and comfort of Morumbi. - Hey, want to buy a shirt? – Asked the father. - There are still three teams, right? I prefer to wait. The second visit was to the Palestra Italia. Toured the clubhouse. They saw the busts of Ademir da Guia, Junqueira, Waldemar Fiume. Also known the trophy room. They sat in the stadium Palmeiras numbered. - Son, this team is different from others because of the connection with the origin of the fans. Palmeiras has a blood link with Italy, called Palestra Italia. 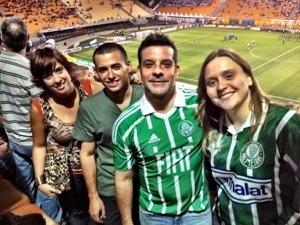 Of course, one need not be Italian to root for Palmeiras, but it’s nice to see this family relationship with the team. The palmeirenses are passionate about that shirt. Great aces came here over time. Both the team is nicknamed “Academy”. – Said the father. Palmeiras won the boy vibrated. Liked the environment at Palestra, the proximity of the lawn. - We’ll buy the shirt? – The father asked. Next stop, Belmiro. In the car, going to Santos, the father began to talk about the glories of the team. - My son, this team you will know today is a legacy of football. It’s the team that played Pelé, the greatest player in history. Had the best team of all time in the early 60s, when there was no enemy on this planet who could beat him. You will see the number of cups they have. Visited the Memorial of Achievements and its impressive collection of trophies. The photos of “timaço” that conquered the world twice, and the Pelé of so many legendary players. The Saints won the game, boy was thrilled. In the village, I can get even closer to the field. On output, the same question. - We’ll buy the shirt? - Calm father still has one game to go we do not have? And were the Pacaembu, on a Sunday afternoon. They could not leave early from home, were a little late. The father was talking about the Corinthians in the car. - Son, we’re going to Pacaembu, but Pacaembu is not stadium of Corinthians. It is from the “city hall” because the Corinthians not have a stadium of their own. But the fans feel very well there. Another thing: the Corinthians is the only team from Sao Paulo who have never won the Copa Libertadores (note: at this point on time, Corinthians had not won …). But there’s an interesting detail: the largest crowd of São Paulo, and the second largest in Brazil. It’s a passionate crowd that is so called “loyal”. This crowd was more than twenty years without ever winning a title, however, incredibly, was precisely in this period that the crowd grew more! Difficulties to park your car, confusion on the descent of the stairs, pushing and shoving, running, etc … finally arrived in front of the Pacaembú. Arriving near the box office, they saw a dark-skinned man in flip-flops, buying your ticket with the last traded his battered wallet. Suddenly, the father noticed something scary. His son was creepy, altered respiration, crying euphoric, restless, while laughing to himself, happy as if he had won the greatest of gifts. - What happened, my son? - I do not know, Dad. The game was about to begin when the boy grabbed his father’s arm. - Dad, I want a shirt. - I chose the father. Thanks Christopher, in hindsight, I should’ve declared my choice when I first wanted to, but I dragged it out to go see Palmeiras and Santos live, which took longer than expected. Having said that, I have no regrets. 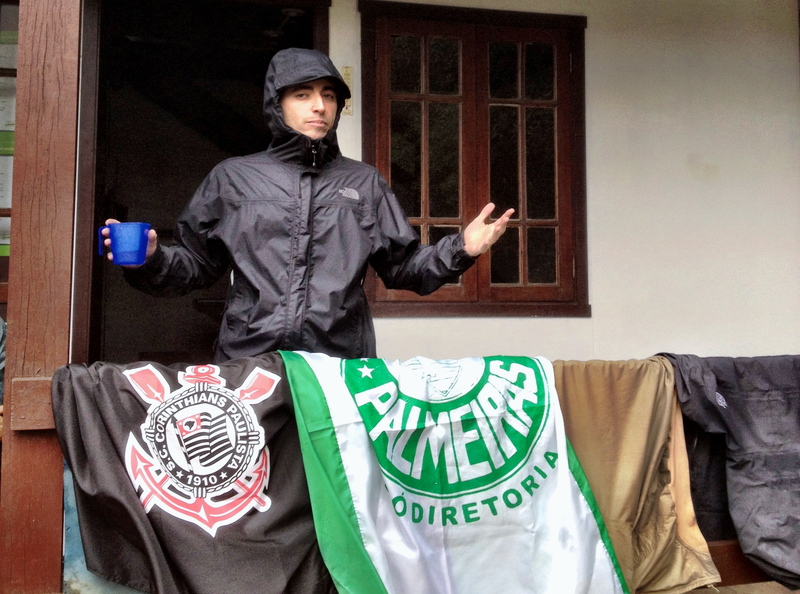 The fan base is passionate and actually feeds off of failure and setbacks, much more resilient than the other fan bases who are barely chirping right now when their teams are playing poorly (Palmeiras, SPFC and Santos). I’ll be there Sunday actually, my first clasico! Thanks for reading!